A seven year old movie star by the name of Kazuki Kinukawa comes to the Moore office to try and find his mother who abandoned him at the office. His reasons are to tell his mother he will not give her any money now that he is famous. Conan finds out that the kids mother is at Atami due to the old dirty postcards she sent him. Kazuki reveals that he remembered that his mother had a mole near her breast. A man who is trying to confirm the rumor that Kazuki's father is a murderer is found dead in a tub. A picture is found on his cellphone; The culprit is a woman with a mole near her breast. Conan finds out who the murderer is. Conan also figures out the culprit was one of the woman who pretended to be his mother and was the one to spread the rumors. Conan reveals that his real mother is also here, and that she truly loved her son and the same for her son; the postcards were dirty because they were stained with tears. While signing autographs, Kazuki gives his mother a postcard and tells her to send it to him or he'll visit her again. He leaves while wearing his sunglasses and his mother cries and apologizes to her son. Sonoko's uncle wants to capture Kaito Kid to improve his fame. Kaito Kid arrives on the scene and seemingly walks on air to investigate the treasure he will steal. Conan investigates and finds out the trick Kaito Kid used. The second time Kaito Kid tries to steal the jewel but it was revealed to be a distraction. Kaito Kid steals the jewel from indoors and is making his escape on a motorcycle when Conan is found to be on the passenger seat. Kaito Kid manages to lose Conan and escape once again. Takagi and Sato are on a date at Tropical Island while the Tokyo police force try and prevent Takagi from making a move with Sato. Later, the Detective Boys are bought up and Takagi and Sato are forced to watch over them. Later Takagi's bag with a wedding ring in it is switched, and Takagi finds out he has a bag of cocaine. With evidence from the bag and elimination, they are able to track down the culprit and arrest him but Takagi's bag is lost in the ocean in the process. Sonoko, Ran, and Conan go to the school where they discover the real Dr. Araide is back. He informs Conan of what happened, and told him that Jodie told him to tell him everything. Later, Sonoko rants on about the death of a student terrorizing the school, and tells them stories to support this claim. Later the desk is found outside with a name on it. What's strange is that it's raining, yet, there's no footprints in the mud. Conan solves the case and reveals the culprit was a close friend to the dead student. The culprit reveals that he found his friend's desk in the storage room with a name on it, thinking he was murdered. The other students reveal that he died saving a student that fell off the stairs while holding a heavy sculpture. Another student explains that his desk was put in the storage room to store his desk for graduation and was not to hide evidence. Dr.Araide reveals that the dead student held no grudges when he died. An old lady is found dead after a pot falls on her from the top of a building. Officer Chiba is sent to investigate, and Conan helps him figure out who the culprit it really is. The news, of course, comes to a shock to Amy, who just happens to look up the culprit. Mouri is hired to stalk a man. He follows the man and finds out his attempted murder on a woman. He later flees but falls off a building. Later they find out his twin brother also died at the same time he did. They decided they are two separate cases but Conan is suspicious as the man attacked the woman whom has no relationship to him. After interrogating the woman, they learn her boyfriend was a gold digger and that he was spotted talking with the attacker from before. Conan figures out that the two exchanged murder targets so they would not be suspected of the murder. The culprit reveals that he did it so his gold digger career would not be endangered. The Detective Boys are out fishing when a man is found to be poisoned. Conan investigates and with evidence proves who the culprit is. The culprit reveals that he did it to the victim for cheating on his(victim)'s wife. The wife reveals that that he divorced her not because he was cheating, but because he was going to burrow money to start up a business, and if that business failed, he did not want the debt collectors to burrow his wife. Agasa arrives and reveals that the victim made a full recovery and that he will forgive the culprit if he catches wife for his wife. Sonoko has taken Conan to the "Candy House", in there, Conan meets a group of three masters who make pastries and puddings: Maeda Gou, Fujino Yasuo and Morimoto Tomomi, and they have tasted the things that the three of them have made, which are very delicious. However, Morimoto has had a quarrel with their manager Hashigaki in front of them. Then, after a while, they suddenly hear Maeda's scream. When everyone has gone to see what is happening, they see the pitiful sight of Hashigaki who has been beaten to death, and must solve the mystery of the murder. Doctor Yokoto Owada of the Beika Central Hospital wins the third place prize at a raffle. The raffle makes it his third winning of the week. When Conan returns home, he discovers that the one year supply of beer that Doctor Owada won is a lie because the draw didn't start yet. The next day, the Detective Boys find out the raffle had been fixed by a tall and slender woman posing as the doctor's wife and when walking down the streets, they overhear gossip of the doctor's other made up winnings. Following the trail of gossip, they soon find the woman responsible for the rumors named Akiko Shiina and her motive. Conan dismisses the case to trick the Detective Boys into going home, but returns at night to stop Akiko from murdering the doctor. Conan and the gang visit a game company where they end up with a tape, they believe to be a new edition of a video game. They end up being haunted down by the President of the gaming company, but they don't know why, until they actually put in the tape and see something that put's their lives in danger. Mouri, Ran, and Conan are attending an interview with a famous baseball player. On the way there, they witness the player dead on the street. Conan suspects a man but his alibi is perfect. Conan begins to also suspect the man to be part of the Black Organization. After investigating, it is revealed the culprit took three plane rides to create his alibi. Conan realizes the culprit had no ties to the Black Organization. Mouri after solving wonders how he can give an autographed baseball to his wife but then realizes since the baseballer is dead, the baseball is a collectors item. Conan and the group meet spider researchers. One of them gets a call, and they rush to the facility on to find their Professor fallen deadly to a poisoneous spider. Conan discovers that the spider was already dead before the Professor came into contact with it, and there's a needle on the ear piece, pointing to murder. For an astronomical observation, conan and the group went to this pension deep inside the mountain. Other than the pension owner, there were also other three people in the pension, the victim's fiancee and the two magazine staff. As they went to the nearby hill to see the stars, they saw a decayed bones and on top of it they found the dying message and then that night the other man from the magazine staff was killed and left another dying message. Episode 23 - Time Limit 15 hundred hours! The Detective Boys are on a camping trip accompanied by Ran. Later they witness an arguing couple who then leaves. They then set up the tent in the couple's area. Later, the couple returns demanding their place back and the girlfriend decides to let them have it. Later Ran is drugged and kidnapped. The kidnapper is later found in another car in a road accident. Conan reveals the boyfriend hired the kidnapper to murder his girlfriend, but captured Ran instead because of their tent placement. After examining some clues, he realizes that Ran is in a river and that the it will flood at 3o'clock. After saving Ran, everyone becomes exhausted except for Ran who has just woken up from her nap. The Detective boys are out to solve a series of riddles found in time capsules which when found will lead to the next one. Later they find a woman murdered. Conan solves the case and the final capsule revealed the secret of the group who buried the time capsules, The Peach Tree club. Episode 28 - Which One's Reasoning Show? Heiji and Kazuha make a surprise visit. Later at a restaurant, Heiji and Kazuha argue what they should attend tomorrow, a theatre or a baseball game. Mouri decides to let the solver of a murder to choose the event and everyone agrees. Mouri, Heiji, and Conan are against Ran and Kazuha. Heiji decides to throw the match for Kazuha but he accidentally solves the case. Kazuha tells Ran she does not really mind, as she just wanted to see Heiji's excitement when he solves a case. This special Christmas episode of "Detective Conan" is introduced by Heiji Hattori, Conan Edogawa, Ran Mori, and Kazuha Toyama. Heiji won a bet in the previous episode and so it's decided that they're all going to the high school baseball finals in Koshien Stadium. But there is a mysterious guy willing to commit a suicide bombing there. This incident just puts more stress on Conan and Heiji, even though they came to a ball game for amusement and relaxation. The unknown person gives them a chance to stop him, however. Heiji and Conan are both struggling to crack the codes, sent by the mysterious man, before the bomb goes off. Earlier, Conan and Heiji witnessed the person walk by them and they thought he dropped his cell phone, when he purposely left it there to "play the inevitable game" with them, consisting of cryptic text messages. In order to solve this case and save countless lives, Heiji and Conan would need a lot a background information dealing with America's favorite pastime, baseball. Mouri is targeted by a killer who is after Kimura. Mouri accidentally took his jacket at a bar and now the killer is trying to kill him. Conan finds out that Kimura is not who he seems to be. Kimura is said to be at a lake and Mouri goes to investigate. There he is seemingly shot by the culprit but, in fact, Conan has set a dummy in Mouri's place. The culprit reveals his motive was revenge. Conan tries to figure out the phone number to the boss of the Black Organization. Mouri is invited by a granddaughter of a rich household to solve these mysterious accidents that happen whenever someone tries to play a Stradivarius for her grandfather on his birthday. Four incidents have happened on that day already and it is about to come up again. Later a fire occurs and a man is burned to death. It is revealed that the house hold are killed off one by one in the order of the C Concert scale. The grandmother of the house was revealed to be emotionally shocked after the death of her son; Every midnight, she would leave her room carrying the Stradivarius like a child. That night, she breaks the violin, and falls out of the window. It was revealed the culprit taped up an object to lure her to the window where she would fall to her doom. Conan figures out the object was the real Stradivarius that lured the grandmother to fall to her death. He reveals the culprit to be Kyousuke. Kyousuke reveals that the Stradivarius was originally from his family. One day, the Kyousuke's father was asked by his brother, Choichirou, to burrow the Stradivarius. He then attempts to to send back a replica to Kyousuke's father, but was found out. In an argument, Kyousuke's father falls down the stairs. Choichirou orders his family to not call the ambulance and to staged it as robbery. This is the cause of Kyousuke's father's death. 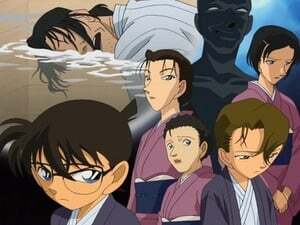 As Kyousuke is taken away, Conan asks him the tune of a song from the cellphone numbers and finds out the Boss of the Black Organization's number is the song of "The Seven Children". Yumi overhears that a promotion for Takagi will send him to a case in a far away place where he shall remain there until the case is solved. Apparently the case involves a large number of people in a crime organization, where he is expected to be there for three years. Later the Detecitve Boys are walking home when they noticed a strange jogger. Takagi, Sato, and Chou are placed on the case of a murder. The Detective Boys come across them and identify the jogger as the suspect. When they arrive, the suspect's allibi of video recordings proves he was there the whole time the murder took place, but the Detective Boys are certain he was the jogger. What's more, the allibi is confirmed by Officer Chiba, since it's his roommate. It was the beginning of the night at midnight that Conan, Ran, and Kogoro have dinner at midnight. After the meal, Conan went to bed, and Ran asks him to brush his teeth before going to bed. She has now became suspicious that Conan is Shin'ichi. She went to the office to check on Conan's cellphone. Ran decided to check for mail in the phone so that she would know that Conan is Shinichi. She typed every pin code in the cellphone, but didn't work. Ran begins to remember what code Shinichi choose. Ran began to type the code 5545, but couldn't. She realized that Shinichi has to choose what code it is. After discovering that the mail isn't there, Ran decided to send it, but couldn't. Just then, she gets a call from Shinichi, who questions her why is she keep sending the mail over and over again. Rachel begins to forget that Conan is Shinichi. In Conan's room, it was revealed that he hides his real cellphone in the bucket.